Very very excited that I won the Abstract Painting Award a couple of weeks ago at my local art society. My kids were very impressed that I won a cup! It’s normally them bringing home the silver for various sporting activities. Here’s the painting that got the award. My fastest painting to sell so far. I went for a walk a couple of weeks ago on the Cornish Coast whilst visiting my parents and got inspired again by the beautiful Lantic Bay beach. I’ve known this beach all my life and it always takes my breath away and always looks different. This painting was a result of the walk and was sold before the paint was dry. During the summer holidays the kids got really into surfing at Saunton Sands in Devon, so having spent quite a lot of time there I felt inspired to paint. These are a couple of little oil paintings. The sea disappears off into the distance and the reflection left on the sand is beautiful. Lantivet is one of my favourite beaches and I never get bored of painting it. I have done quite a few now! This one is quite a large painting and I just really enjoyed the texture and the colours. I’m hoping one day I might go down there and the sun will be out! I’ve visited this beach my whole life. It is situated right at the end of Fowey in Cornwall heading towards the coastal path. To me it’s nostalgic and a beautiful spot especially in the winter. I painted this last week from a photograph I took over the half term. I love the colours and the view of Polruan in the distance. 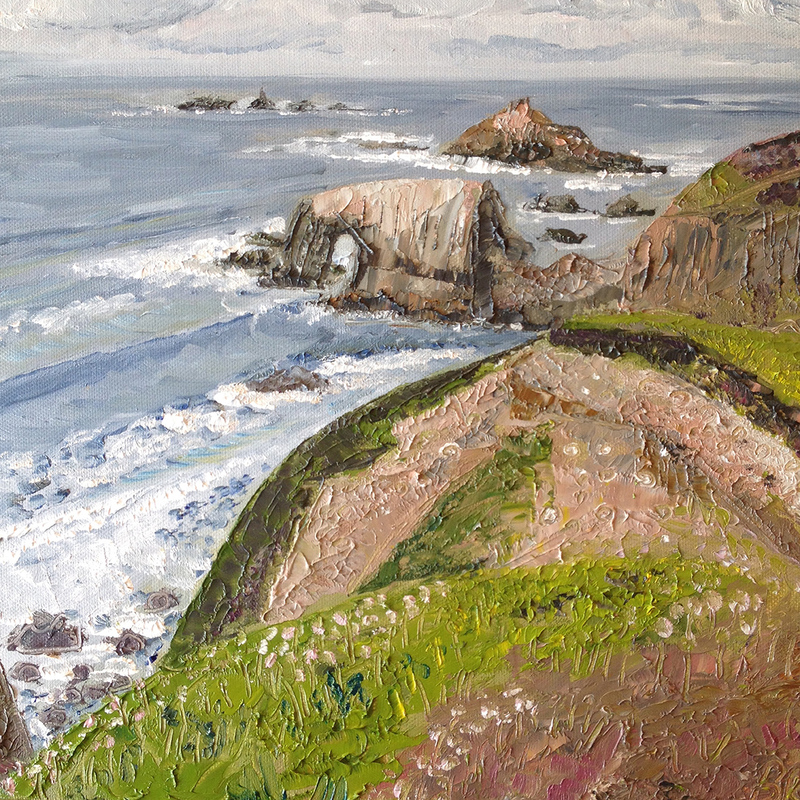 The more I paint the more I become aware of the changing light of seascapes throughout the year. Particularly the colour of the sea has so many variations. It can be a deep deep azure blue in the summer to a pewter grey in the winter and all the colours in between. Here are 2 paintings. The first one is a coastal painting near St Ives in the summer (the sun was actually shining) with intense greens and blues. The second painting is Lantivet at Christmas on a grey day painted with lovely soft muted colours. They are so different but I love the colours in both. I always like experimenting and trying different sizes of canvases. Last time I painted on a very large canvas. This time I did three little paintings on mini canvases 15 x 15 cm. It’s really interesting how it changes the way you paint. On the large canvas I found myself looking at every detail. On the small ones I worked more quickly and more impressionistic. Last summer we found this amazingly beautiful beach near Treen Farm Campsite near Penzance. I had to paint it and I hope I’ve done it justice. I painted this on a large canvas to give the feeling of space. The sea washes over the beach and creates rivers and lakes on the sand. I used brushes and palette knives to create texture and even at one point a toothbrush! Thirteen kilometres West South West of Penzance is Land’s End. 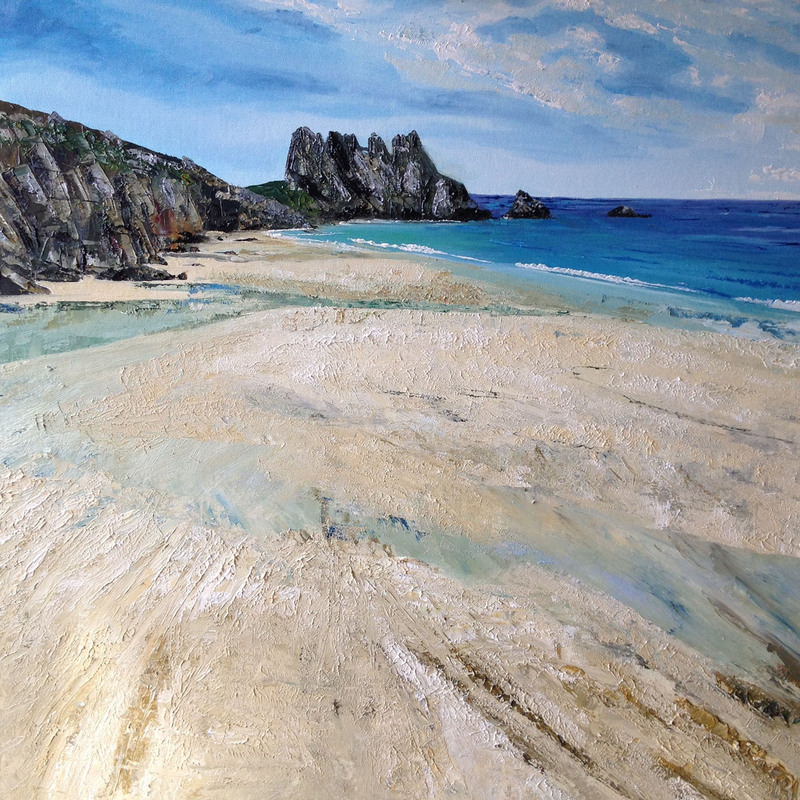 This painting shows my impression of the most Westerly point of mainland Cornwall and England. By road Land’s End to John O Groats is 1349 km. I love this view as the eye travels from the foreground all the way out to the furthest rocks giving the feeling of the land fading away into the sea.